It’s a great alternative to water. Low calorie and flavored. But is Crystal Light bad for you? 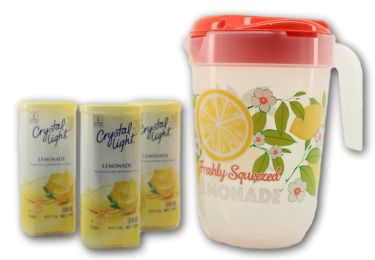 Released by Kraft Foods in 1982, Crystal Light produces a line of powdered beverage mixed that are low in calorie. Each 8 oz. serving contains just 5 calories. This makes it an excellent option for anyone who wants to lose or maintain weight but is tired of the flavorless water. Its list beverages cover over 30 different flavors ranging from cherry pomegranate to fruit punch. They also have more conventional flavors like orange and lemonade. Since its inception, the drink mix has been advertised as a low calorie alternative to juices or sodas. The variety of flavors available also make it more enticing compared to water, especially during those hot summer days. Because they don’t contain fat nor sodium, they are great for anyone on a diet. The 5 calories per 8 oz. serving also lets anyone who’s watching their weight enjoy something other than water. The wide array of mixes of fruit flavors, with addition of some teas, let you enjoy a number of different flavors. But, is crystal light good for you? Though it doesn’t add much to the waistline, there isn’t much to be said about the ingredients in Crystal Light. They don’t carry much nutritional value. As a result, you can’t rely on them to give you any nutrients or health benefits. This makes them pretty much similar to water, where you get no nutrients, but benefit from the fluid intake without any (or much) calories. Why is Crystal Light Bad for You? Crystal Light has for a long time been a known additive that can be dissolved in water to create a pleasant, calorie-free drink that people have enjoyed. Unfortunately if you take a close look at the label you will be able to see that its ingredients are hard to absorb and can lead to bodily harm. 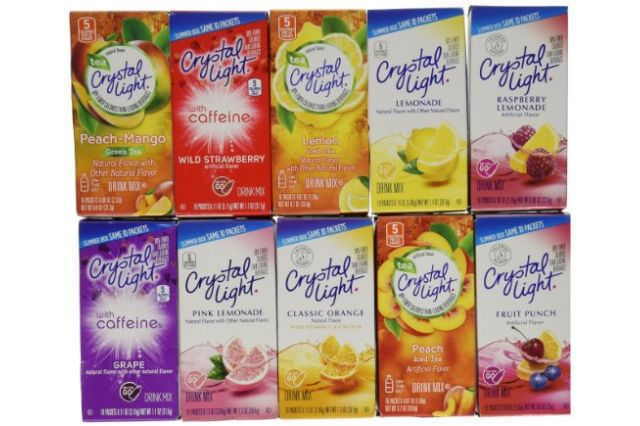 Most of Crystal Light’s ingredients are very similar, but with a few differences. It contains malic acid that can cause diarrhea and might be unsafe for long-term use. There is also natural flavoring. Actually, the term natural flavoring is a misnomer that is quite misleading considering. This is because it that anything from nature, when added to a liquid, could be beneficial or quite harmful to the body. Another ingredient, citric acid, gives the drink a fairly sour flavor and is quite common in many products. Citric acid is likely one of the least harmful substances in Crystal Light since it is a naturally occurring substance. However, it is neither good nor bad for the body. Crystal Light also contains aspartame, which can cause damage to the brain over a period of time. Food dyes that are also included in the mix can cause a high level of hyperactivity in children. Additionally, BHA is also present. BHA, or Butylated hydroxyanisole, is a preservative that can affect the hormonal and neurological systems and as such can alter behavior. For its sweet flavor, there’s some kind of sugar. Depending on the kind of Crystal Light drink you choose, it can be either aspartame or sucralose. Aspartame is the same artificial sweetener found in some other sodas and sugar free beverages. In other cases, it is sucralose, or Splenda. This is another very popular sweetener that unfortunately can cause migraines, gastrointestinal issues, spikes in blood sugar, and other various concerns. Potassium citrate serves as a buffer to regulate the acidity within the substance. Acesfulfame-potassium is another sweetener used that can have negative, even addictive side effects that can harm the body. The color of Crystal Light is actually derived from coal tar, and can cause a wide variety of effects. Typically this type of coloring is cheaper and is even approved by FDA in small doses. This seems to contradict the duty of the FDA by claiming that a poisonous substance is “okay” so long as it is taken in minute doses. Last on the list are potassium sorbate and sodium citrate. 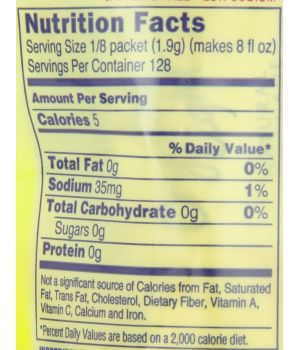 Potassium sorbate is in truth a synthetic compound that is created from a chemical reaction. Sodium Citrate is, for lack of a more complicated word, salt. It is another regulator to balance the acidity used in the drink mix, and is also a preservative. There is really nothing natural about Crystal Light. The drink mix is, for most part, sugar that is loaded with harmful preservatives that can each contribute to bodily harm when used in increasingly large quantities. 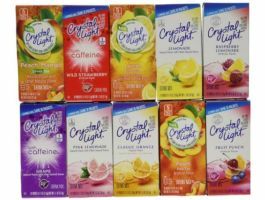 The argument that Crystal Light is harmless when taken in small doses provides little to no comfort when considering that its mass production has caused it to become a widely used product. While many drink mixes are not entirely healthy, the level of preservatives, acids, and harmful substances within Crystal Light make it one of the worst of the bunch. Avoiding this drink mix is not only recommended, but can prevent a great deal of harm.